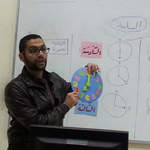 Having tutored Arabic over the past 5 years to over 500 students from every continent of the world, I am well placed and very keen to help you improve your Arabic at a pace and in a way that fits you. I am experienced in Modern standard Arabic, Egyptian colloquial, Media Arabic, Grammar, and literature. I would be glad to help you with gaining fluency in Arabic. Provided instruction using a multi-media approach including the use of printed study materials, flashcards, audio exercises, videos, films, and games to create a more holistic approach to language learning and development; Aided students in developing and improving speaking, listening, writing and reading skills.